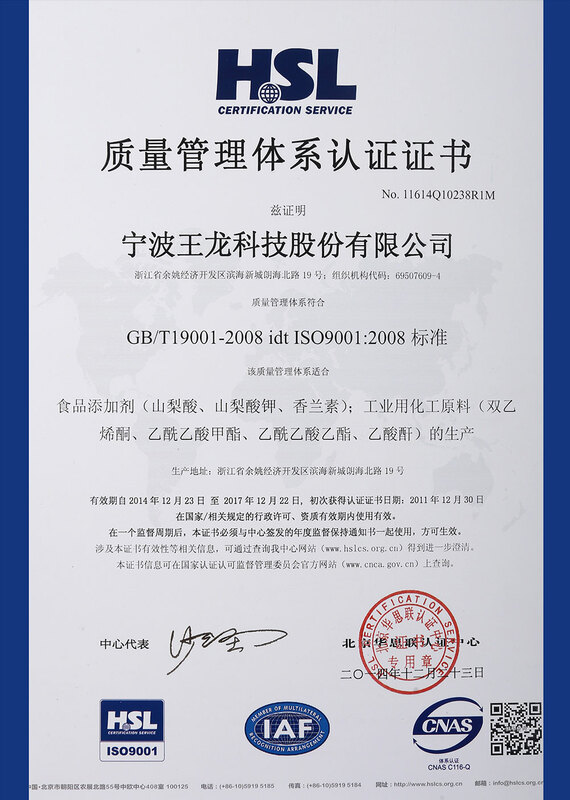 Wanglong Tech Co.,Ltd is a national key high-tech enterprise that was founded in 1992. 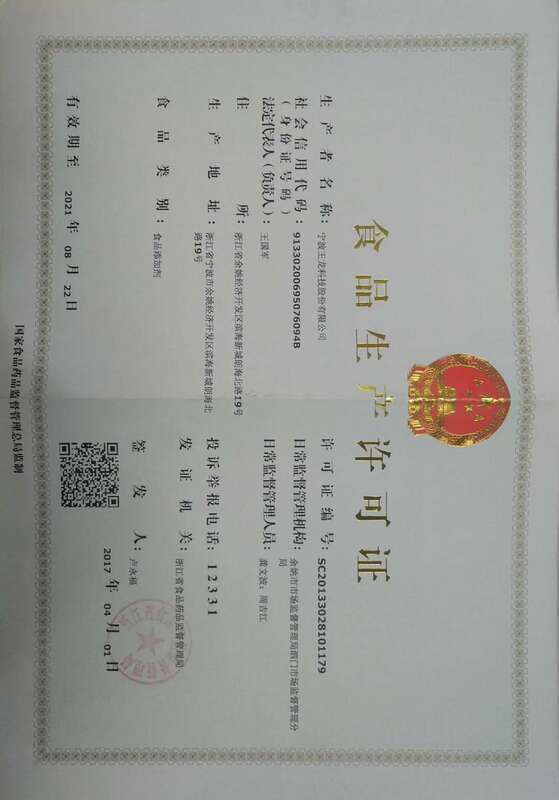 The business covers chemical industry, food additives, vegetable industry, paper industry, packing, real estate, electric wires and finance. 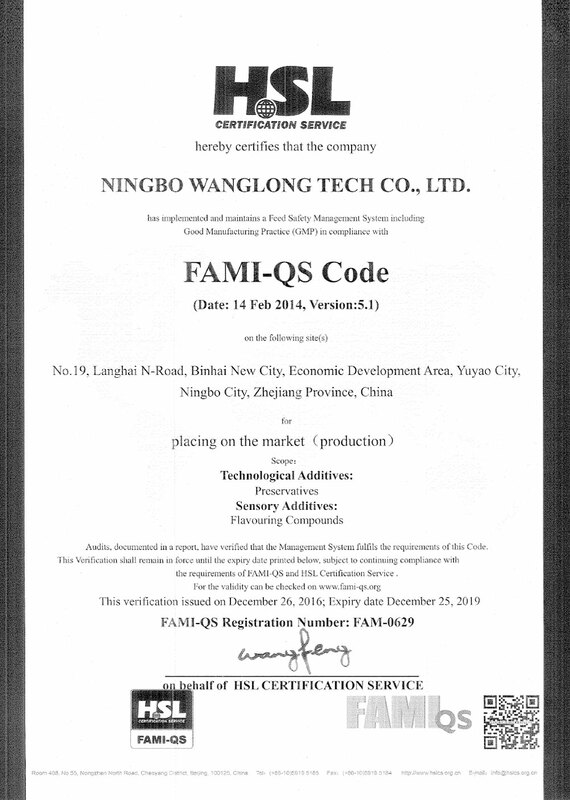 As an investment and holding joint-equity enterprise since 2009, Ningbo Wanglong Tech Co.,Ltd is located in the new town of coastal city, Yuyao near the beautiful Hangzhou Bay. 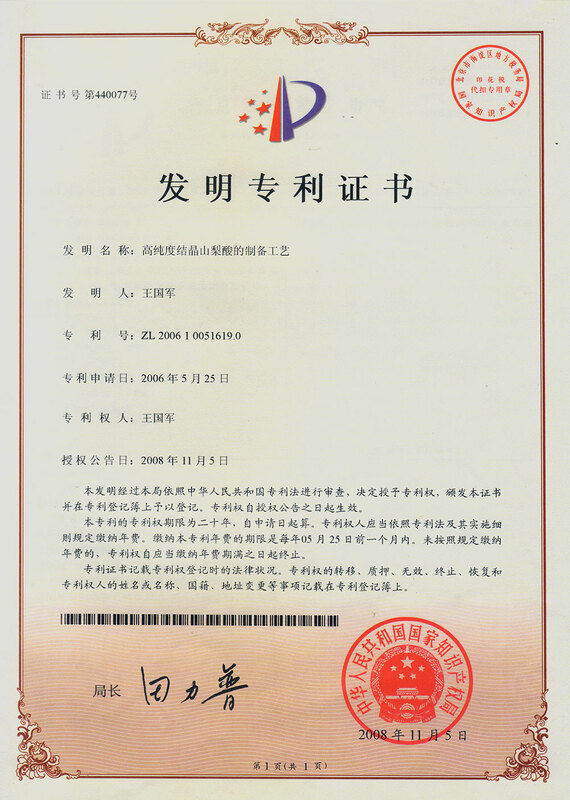 The registered capital of our company is 101.8 million, total investment of fixed assets more than 680 million. 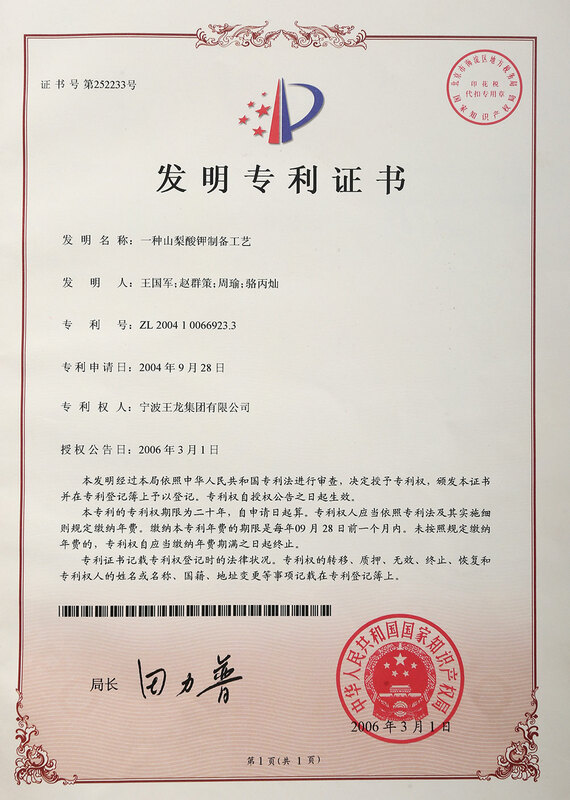 Our company mainly produces acetic acid derivatives, which are divided into four categories: food additives, medicine intermediates, farm chemical intermediates, intermediates for printing and dyeing industry. 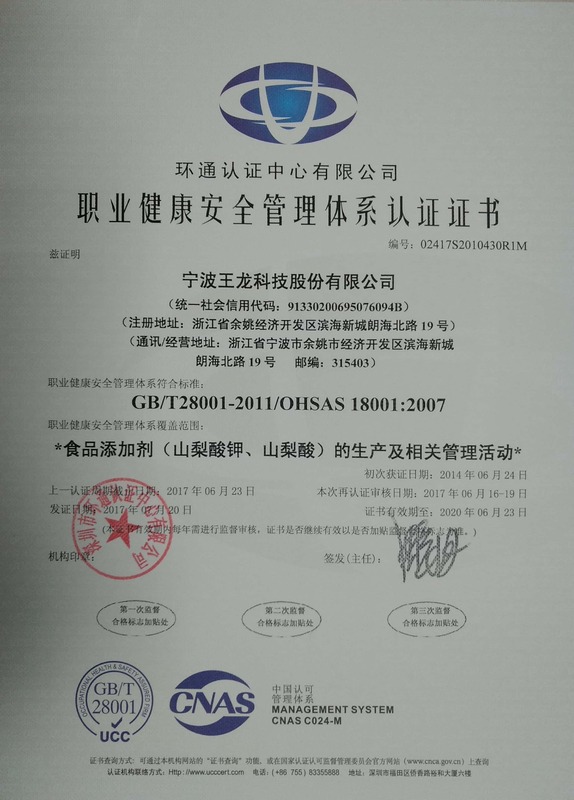 Among them, food additives: annual production capacity of sorbic acid is 50 thousand tons, potassium sorbate 40 thousand tons, vanillin 5000 tons, dehydroacetic acid 5000 tons, sodium dehydroacetate 5000 tons; basic organic raw materials: annual production capacity of diketene is 50 thousand tons, acetic anhydride 160 thousand tons; medicine and farm chemical intermediates: methyl acetoacetate 50 thousand tons, ethyl acetoacetate 50 thousand tons. 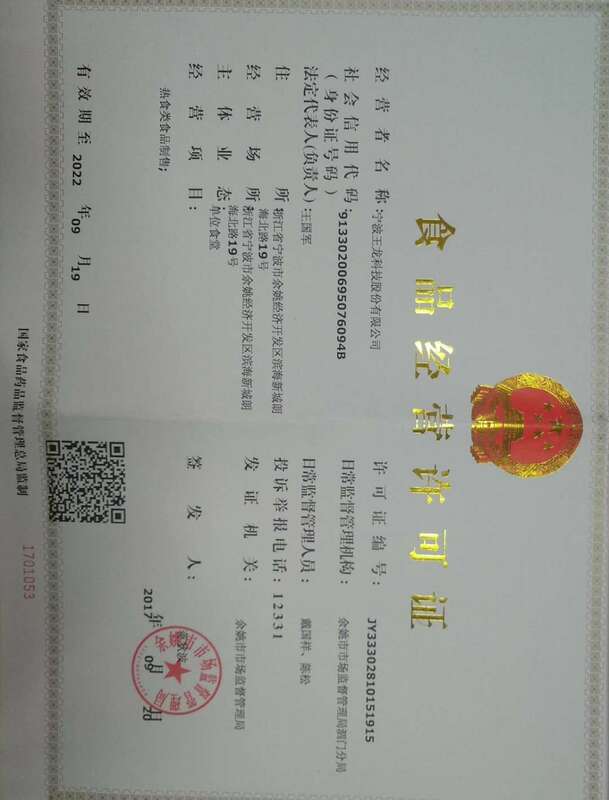 Currently, our company is the largest production base of sorbic acid and diketene and the global market share of sorbic acid covers about 50%; also the largest production base of acetic acid derivatives. Our products are widely used in food, beverage, medicine, farm chemical, printing and dyeing industry and can replace imported products to meet domestic and foreign demands. This is the key developmental direction for fine chemical engineering industry. Our company abides by the operation philosophy of” win by quality to create brand fame” and reaches the commanding height in the industry. 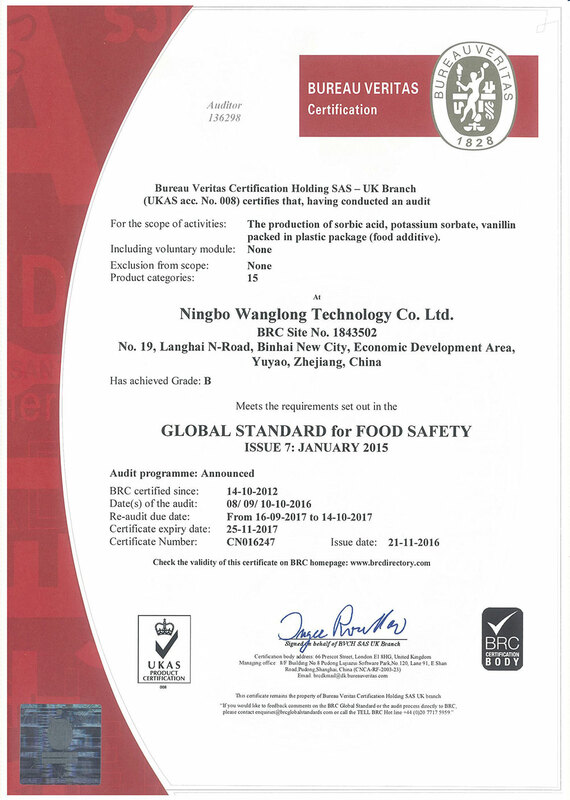 We established and passed ISO9001:2008 Quality Management System; ISO22000:2005 Food Safety Management System Certification successively; the food additives like sorbic acid, potassium sorbate and vanillin passed Global Food Standard Certification of British Retail Consortium (BRC); FAMI-QS European Feed Additives and Premix Feed Quality System Certification etc. In this new 21"century,dramatic changes are taking place in the international management conditions across the globe and a period of indefinite competiton has come. 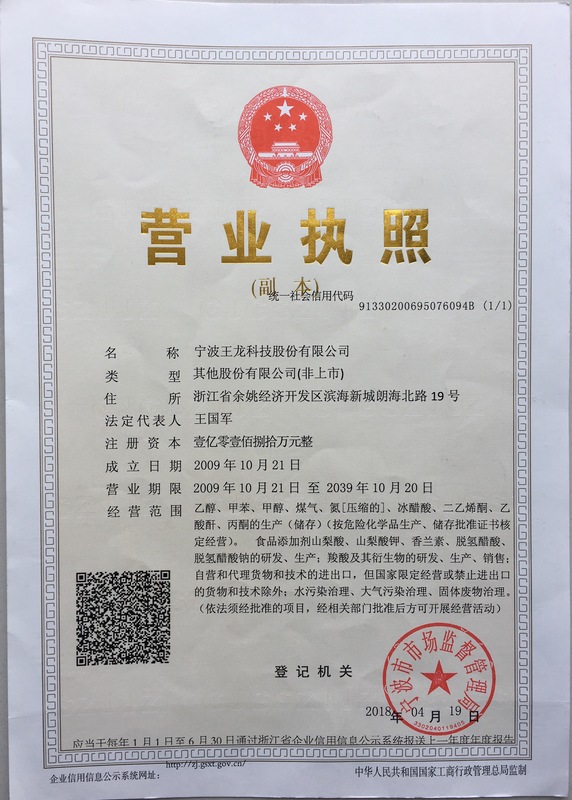 Wanglong Group is deeply cognizant that an enterprise cannot exist unless it develops into a first-rate business in its industry. In order to further enhance its international competitiveness and develop it into a first-rate enterprise in trade, we’re determined to continueexerting itself and struggling on the basis of past accumulation. 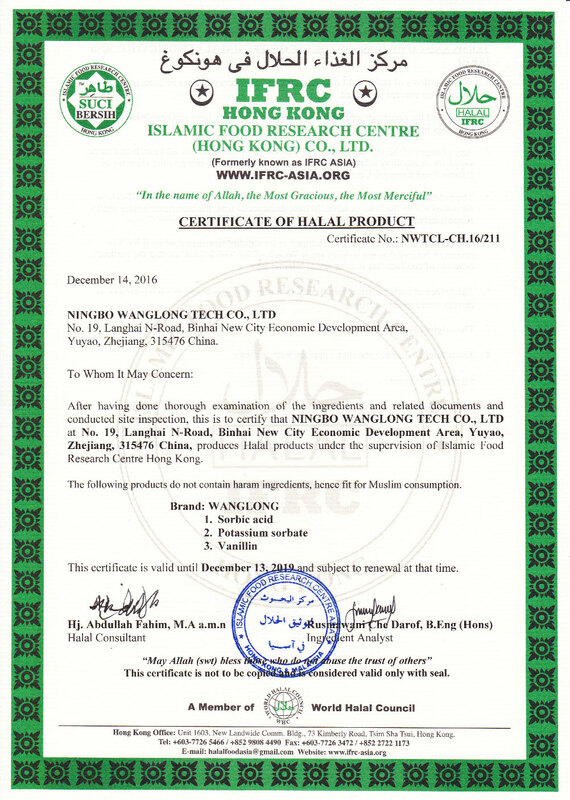 Under the guidance of the new managing policy, Wanglong Group is implementing the operation purpose which takes quality as its main task and regards customers as highest.We shall realize the advancement of technology and devel-opment of creative technology through unremitting efforts in scientific research and development, and on this basis enlarge the realm of our cause. 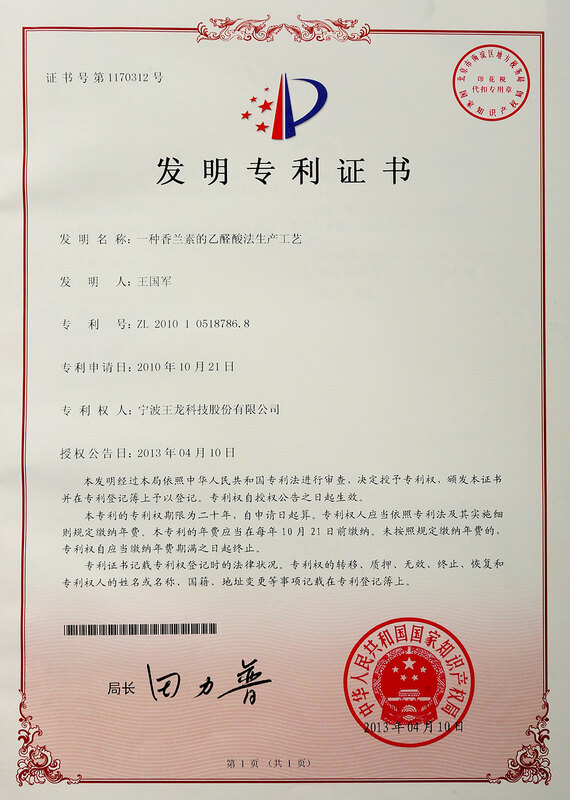 To ensure the prosperity and happiness of human life as well as establish new business culture, we're conducting challenging manage-ment activities for the future. 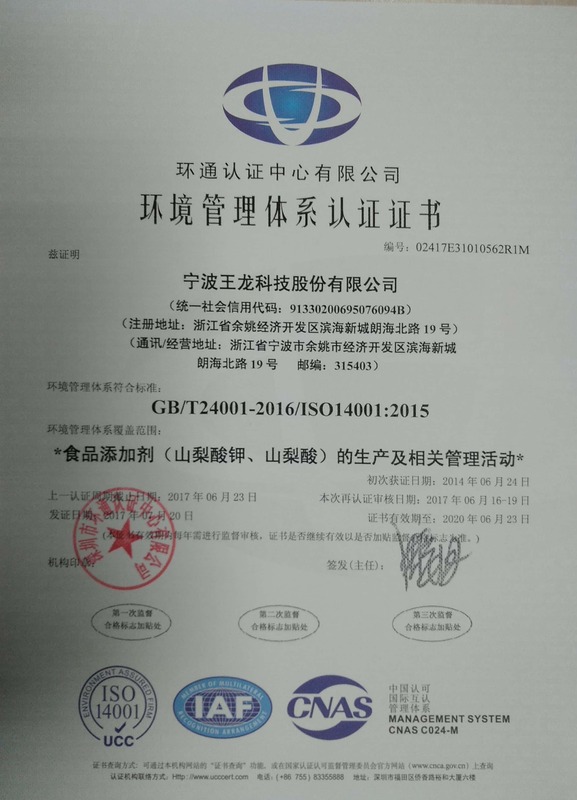 Wanglong Group will make great efforts to expand the scale of the competent realms and become a giant so as to develop it into a first-class enterprise in chemical industry. lt will endeavor to enlarge areas such as fine chemical industry and new materials while setting up production base in the regions which have bright prospects. In this era of opening up, we shall also launch the cause of pyblic welfare under the guidance of new managing policy. We shall perform out duty for the society faithfully, via which we can win popular esteem and achieve mutual prodress with the society. 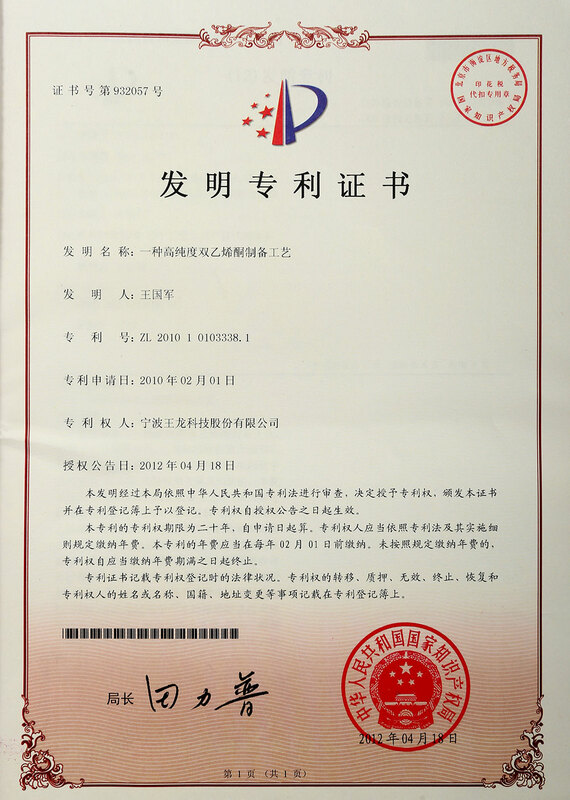 We members of Wanglong Group are resolved to provide customers with best products and services as well as ensure satisfaction from our customers on the basis of technologies of the talents. 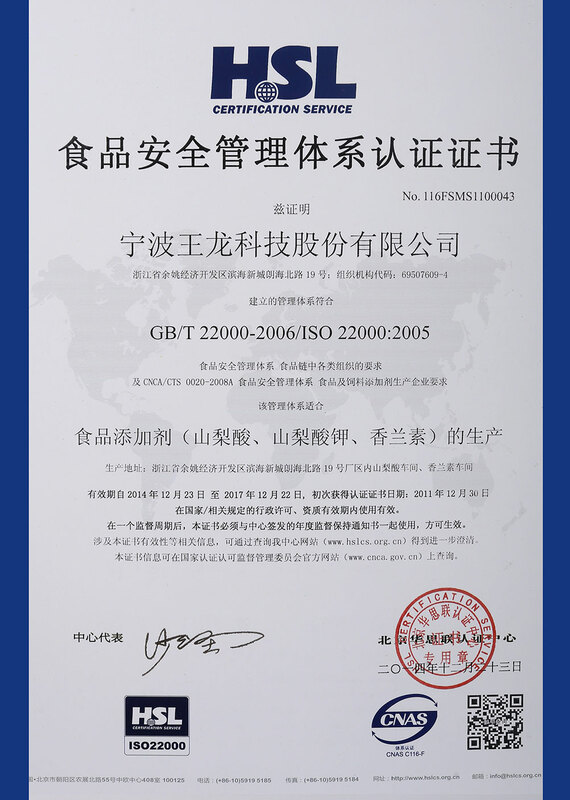 We wish to be togerther with customers to forge ahead into the future.all over the world!